The truth about Beijing, if you’ve been in China a while, is you only need a few days to see the sights, then get out …unless you want to go shopping. Then you could be there a month. Beijing is like many other major Chinese cites: big, crowded, noisy and polluted. After you’ve seen sights I’d advise you to get out or get shopping. The two biggest advantages Beijing has over other cities is it’s connected-ness to the rest of China by plane bus and rail, and it’s abundance of bargain shopping outlets. Also, I understand they are having the Olympics here next year. After a day in Beijing it’s impossible to not know where the 2008 Olympics are being held. The whole city is working 24/7 on the preparations and “One World, One Dream” is pasted everywhere. It’s even pasted up on the Great Wall. After the Olympics are over everyone in Beijing should be entitled to a good sleep, it will be well deserved. As for the sights and shopping, they will be here forever. 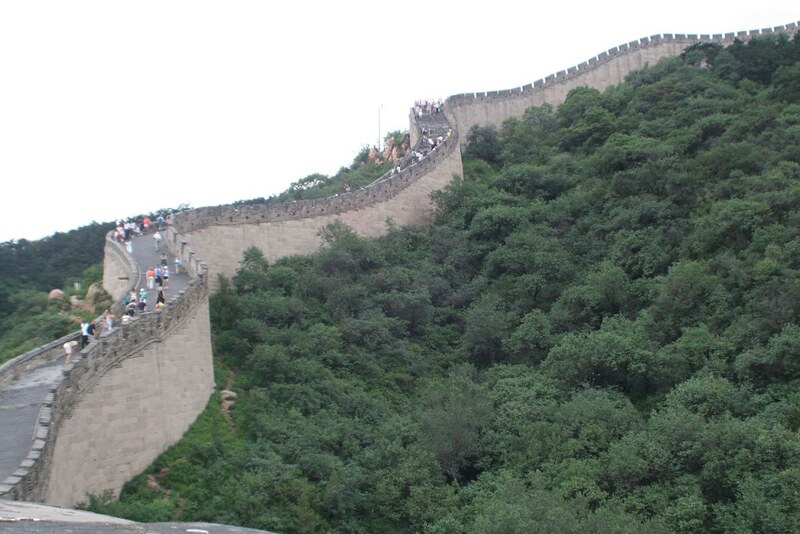 We went to the “Big Four” – The Forbidden City, Tiananmen Square, the Great Wall and IKEA. But the first sight we took in was the smog, it was remarkable. We’d heard a lot about the pollution in China, but hadn’t really seen anything that bad in our first month and a half here. But on the train back from Mongolia we had a chance to check it out, and live in it for our first two days in Beijing. Now I understand – it’s very impressive. We were at one end of Tiananmen Square and could hardly see the opposite end. Luckily for us a storm rolled through and cleared all the muck out of the air for us after a couple of days, leaving us with breathable air. Rumor has it the government is going to restrict personal automobile traffic in Beijing for a month next year to try and limit the smog during the games. Hope it helps. So our visit to Tiananmen Square and the Forbidden City really was like a walk through the clouds – “Can you see it over there?” “What?” “Nevermind.” And sadly, we must report that the Starbucks in the Forbidden City has closed. We got there a week late. More interesting was our visit to Beijings other “City”, it’s “Underground City“, constructed at the height of the Cold War when Mao was anticipating a nuclear attack from the Soviet Union any day. It’s pretty crazy (and much cooler than top-side Beijing in July). They tunneled out many miles and built factories, theaters, etc all underground. Now, you can pay 20 Yuan and get a tour of it. Making up for a somewhat lackluster visit to the downtown sites we headed up to the Great Wall the following day. The Wall is pretty amazing and if you get there early enough you’ll miss the mad crowds. Also, did you know there is a slide from the top to the bottom? I had no idea! It’s a few hundred feet long and and looks like a lot of fun. Our last stop was IKEA. We have no furniture needs, we just went to see one of the biggest IKEA’s in the world and eat cheap ice cream. Note – Alcohol is not regulated in China the same way it is in the States, so at the IKEA Cafe you can order a beer, wine (like LeeAnne did) or hard liquor. Sometimes you need that to shop here I guess. IKEA was actually only the first stop on what was suppose to be a tour of the Beijing Olympic Stadium and Olympic Park. But we never got there – it had nothing to do with the wine. After our ice cream we determined the only way to get out to the park was by taxi – the Metro line there isn’t open yet – and we didn’t want to pay $30 in cab fare that day. It’s a decision I kind of regret as the stadium design is very impressive. It’s ultra-modern – the whole thing looks like a seven story high birds nest. But, it’s okay, I have a feeling it will be on TV some next summer.